Home security and automation starts and ends with the front door. It needs to keep the bad guys out yet let the good guys in without hassle. Either a system gets it right or it doesn’t, and, until now, I had yet to see a system that’s truly impressive. Meet the Vivint Sky Smart Home — a home security and automation system that offers a tantalizing glimpse into the future but is available today. When a person approaches the door, the Vivint Sky Smart Home’s inconspicuous doorbell cam starts recording. 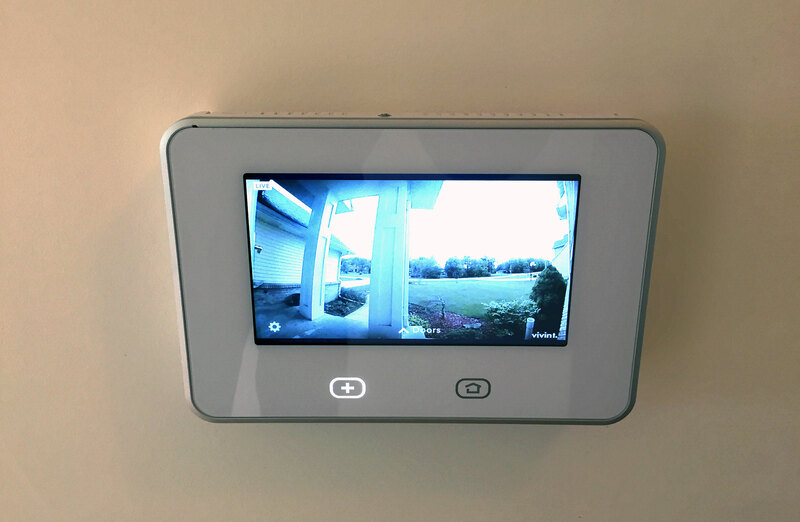 Ring the doorbell, and the homeowner gets a live video feed (with 2-way audio) through a smartphone app or on the system’s wall panel installed in the home. If the person inputs the correct code on the deadbolt, the system disarms and performs any number of set actions from turning on lights to adjusting the climate control. Like good technology, the experience is magical. The Vivint Sky Smart Home is pricey but it’s more complete than anything offered by Google, Samsung or ADT. I’ve tried the new system. It works as advertised. The doorbell is the most impressive part of the system, too. It’s tiny, and unlike most doorbell cameras, the video doesn’t look like it was shot through a fishbowl. It takes about 8 seconds to load the live video after the phone receives the alert. Vivint tells me that within a couple of months, the camera will be able to authenticate faces and unlock the door and disarm the system within seconds. The Vivint Sky Smart Home is a compete security system with window sensors, motion detectors, additional cameras, smart climate control, and a connected smoke detector. The system is inclusive and comprehensive, which makes it so special. Home owners and installers can pick the parts needed for each situation. The company designed everything to work harmoniously. It’s not cobbled together or reliant on a collection of apps or online recipes to perform certain functions. The inherent downside is that everything comes from Vivint itself; a homeowner cannot buy most components at Best Buy. Right now there are two ways to automate and secure a home. Either piece together a system, item by item, from makers such as Google, Samsung or countless startups. In this scenario the homeowner buys the items, many of which were designed independently of each other, and cobble them together into a single workable system. But there will be holes in the shield. Often homeowners are authenticated by a Bluetooth or RFID device, but what if the phone is left inside the house by accident or a child needs to gain entry? APX Alarm Security Solutions rebranded as Vivint in February 2011 in an effort to be more than just a home security system. A year later Blackstone purchased a controlling interest in the company for $2 billion. From what I can tell, the company didn’t just change its name and get new management; it overhauled its business. The company recently opened a large tech lab in Utah and has steadily rolled out innovative products since becoming Vivint. Vivint is not alone in its quest to expand past home security. ADT, Comcast and Verizon offer similar home automation and security systems. I’ve tried these as well and they’re comparable to Vivint’s offering prior to launching this latest platform. With the new Sky Home System, Vivint is the closest a company has come to truly automating a home in a meaningful and harmonious way. Security and authentication should not be dependent on a device or key fob. Homeowners should be able to walk up to their home and have the system unlock and disarm automatically. Until recently, the front door was secured only by a lock and a key. Then came keypads and smart locks. The next chapter in home security will do away with everything extraneous and it seems Vivint is helping write it.